I love the color coral! Actually, anything in or near the orange family makes me happy. Even my bridesmaids dresses were a peachy coral color. Don't laugh... it was the 80's! So, needless to say, I have been thrilled this summer when every magazine I open up has coral as one of the most popular colors in home decorating. It has a drawer, but I had already taken it out when I snapped the picture. I paid $7.87 for the table! 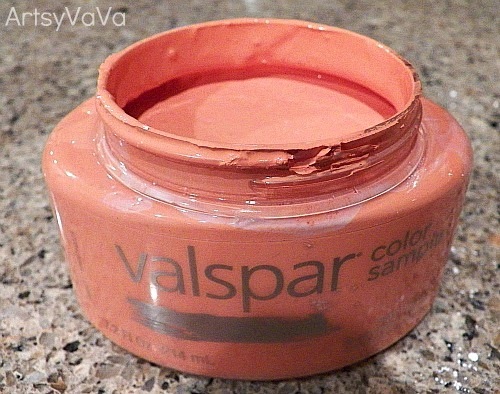 I bought a sample size of Valspar paint at Lowe's in a shade of coral. The sample sizes cost $2.45. I added about 2 tablespoons of calcium carbonate and a few drops of water to the paint to make some chalk paint. 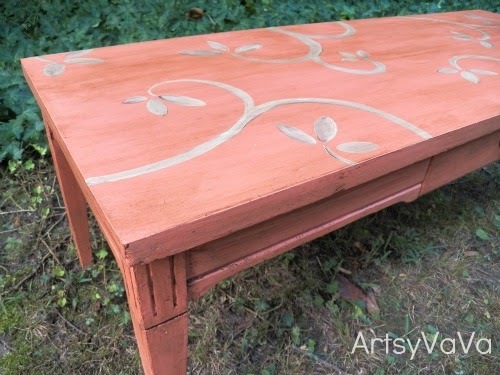 I gave the table a couple of coats of the homemade chalk paint and then hand painted a leaf design on top using acrylic paint in cream and brown. Would you be bold enough to put a coral coffee table in your house? Wouldn't it be pretty in a sun room? Pretty color-and I love the detail on top! 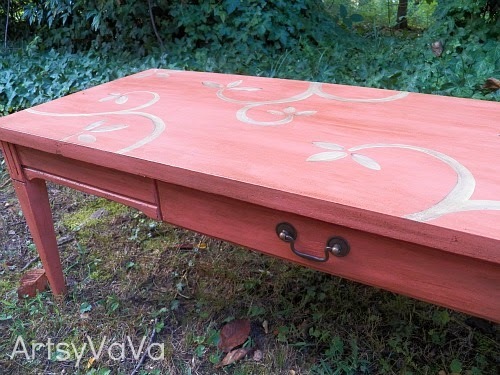 what a fab project - I have an old chest of drawers that I would like to do something with and this has given me some ideas - does the additions to the paint take away from the durability of the finish? The orange color family doesn't make me smile but your table does! 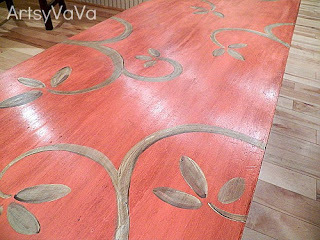 I love the look of the handpainted leaf design though, it really add that extra 'something' to the table that takes it from function to artistry. so pretty! i can see it in a beach house with tan sofas and aqua accents! Your coffee table is gorgeous! The vines and leaves really set it off. Love the gray tone with it! THE TABLE TURNED OUT BEAUTIFUL AND I LOVE THE COLOR! 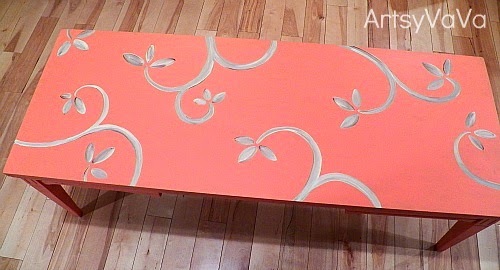 I would LOVE to put that coral on my coffee table! It would great with the furniture and rug and it would be a surprise to my eyes everyday! It's a beautiful color and could go anywhere. Very nice transformation!! I love the color coral. I have a bedroom that is a similar color and I call it Charleston Peach. :-) I'm glad to be seeing it in decorating too. It's such a fresh, cheery color! I love this makeover - what a gorgeous color! You're a woman with a statement and not afraid to make it! This is bold and beautiful - love it! Came over from Rustic. It is so pretty! You did a great job with the leaf design too! 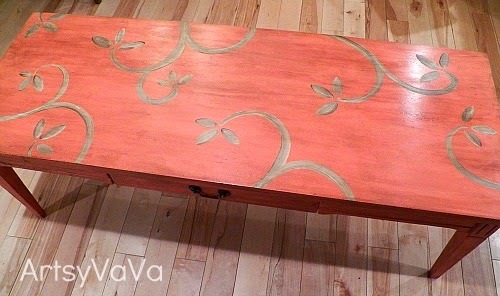 Love the coral with the dark wax! Thank you for linking this up to Rustic Restorations Weekend! You are so talented! Beautiful job as always! Thanks for sharing at the Pomp Party! Pinning! I love this table and your recipe for chalk paint is a lovely bonus. Thank you so very much for following my blog . . . I truly appreciate the encouragement and support. Found this link on Blissful Bucket List....I love this piece! And the 2 tones of the acrylic paint almost make it look like that design was carved into the wood. Gorgeous! That came out so good. I love the look that the dark wax gives. Absolutely stunning! Visiting from the Bowdabra Blog link party. this is beautiful! 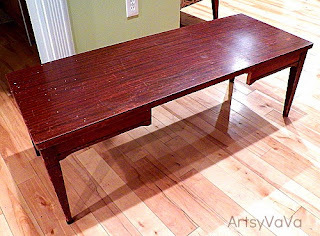 im sure it will be a wonderful addition to your home :) thank you for sharing! Wow!! So beautiful! I love the leaf design. A bold signature piece for a room. That's such a pretty color! And the leaf design makes it so perfect! New follower, would love the follow back! Now that's a piece that would cost you a pretty penney in a furniture store. One of a kind hand painted and all. Yes, I would definately be brave enough. I love a pop of color! Thanks for sharing your talent with Share Your Cup. 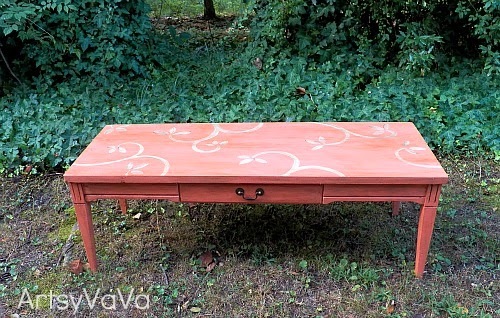 Great looking table...love that color. 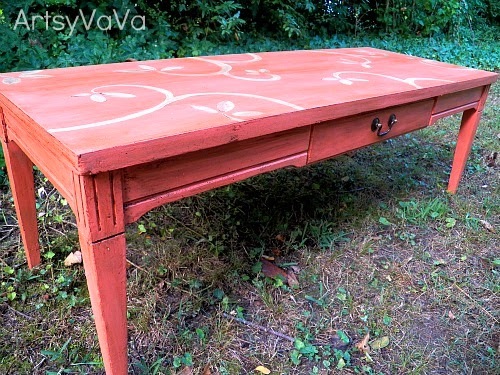 I just had that same table a few months ago, and did a makeover on it too. Thanks for sharing at my party. great job on the table! What a great re-do! It looks amazing and I'd love to have this in my home. Great job! It looks so good! Love the color! My Get Social Sunday link party is live. Would love to have you come link up your homepage and promote your blog! I love the outcome and the detail on top...well done! Very pretty! I think my fav colour is peach, which is not all that far off from coral. Thanks for sharing at Etcetorize this week! I LOVE the color! It is just beautiful! AND you hand painted the top? You go girl! Great job. You've got some awesome talent! 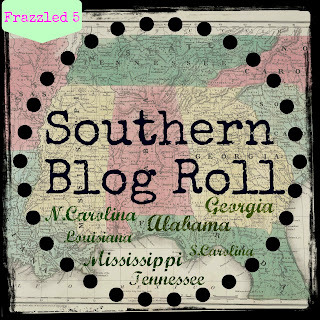 Thanks so much for linking this up to our Weekend Wonders party! We hope to see you back again on Thursday :) Have a great week! Found you from take a look tuesday! New fan and follower. I love that table, it's so pretty!! You coral table is beautiful! New follower for you today! Hope you will stop over at my place~I'm running a great jewelry giveaway this week! What a difference! Great color too! Thanks for sharing at Shine on Fridays! WOW...love it! Would love it if you http://www.onemoretimeevents.com/2012/08/share-it-one-more-time-5-and-features.htmlwould share it at Share It One More Time. Hello there. Just stopping by to let you know that I featured your coral coffee table today :) Come by and grab a feature button if you'd like. Have a great day! I love coral too! I would definitely put it in my house. Love the coral too! 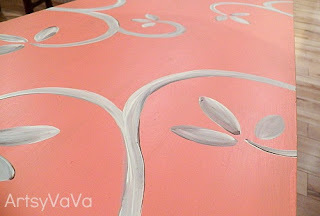 I spent an hour today looking at paint colors and never thought of coral...Thanks for linking up! wow! 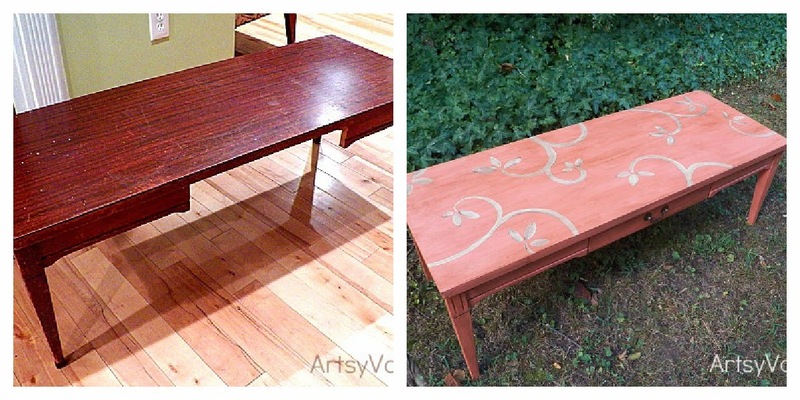 that $7.87 table looks like a hundred bucks worth after your makeover!! awesome!! Pretty color and design! Thanks for linking up! How cute is that! 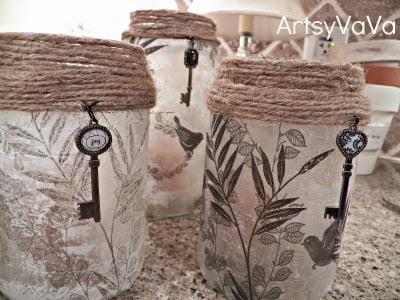 Thank you for sharing this at my Make it Pretty Monday party at The Dedicated House. Hope to see your prettiness again on Monday. Toodles, Kathryn @TheDedicatedHouse. I love your color and design...so beautiful! I'd love for you to share at my party...it just opened!